Bournemouth boss Eddie Howe says he will not be letting anyone leave the club on loan, including veteran former England international Jermain Defoe. The 35-year-old, who has only started 11 Premier League games for the Cherries since joining the club from Sunderland in the summer of 2017, has been linked with a loan switch to Nottingham Forest. The Championship club are allowed to make loan signings until Friday's deadline. Forest manager Aitor Karanka had been quoted as saying he was interested in bringing ex-West Ham, Tottenham and Portsmouth striker Defoe to The City Ground, but Howe said after watching his side beat MK Dons 3-0 in the second round of the Carabao Cup: "I'm not going to let anyone go. Our squad is our squad. I've said before it's not huge on numbers. "We have 22 established, first-team players and, with a couple of injuries at the moment, Jermain is a valued member of our squad. "We only have four strikers and that's not many so there is absolutely no chance (of Defoe leaving)." Howe also revealed that Lyn Mousset had twisted his ankle during Tuesday's match while Marc Pugh looks set to miss this weekend's match against Chelsea because of a hamstring injury. 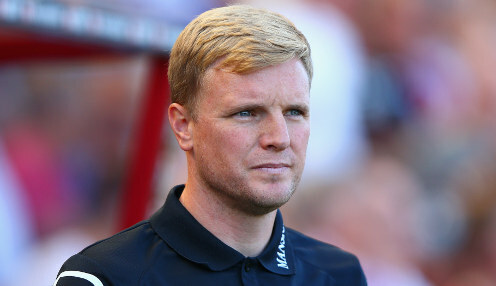 Bournemouth, who have taken seven points from their first three Premier League games of the campaign, are 10/1 to beat Chelsea and 12/1 to keep a clean sheet in the match.